We guessed how big around her belly was, how many Reeses candies were in a baby bottle, guessed the flavor of baby food and tested who could tie their shoes their fastest (with balloons under their shirts). We also did a diaper raffle - where everyone brings a bag of diapers for the new parents and are entered into a raffle for a great prize (i.e. a bottle of wine in this case). For the other games I put together little spa/pedicure kits for the winners. Everything was bought at the dollar store and turned out great! 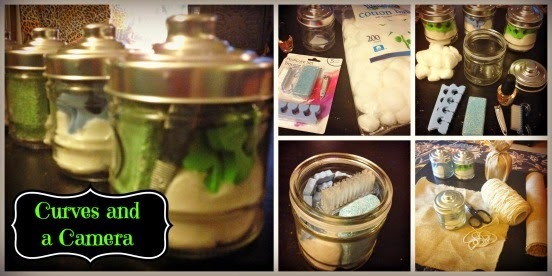 A glass container, cotton balls, clear nail polish and a pedicure set....ta-da!! They were a hit!